Annie Besant, née Wood (1 October 1847 – 20 September 1933) was a British socialist, theosophist, women's rights activist, writer and orator and supporter of Irish and Indian self-rule. 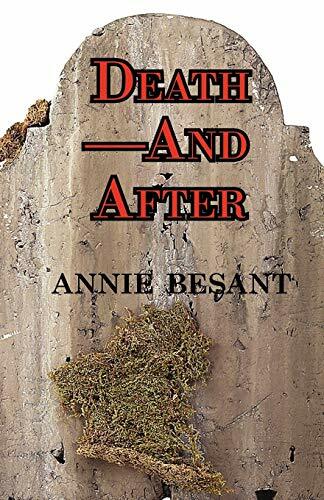 In 1867, Annie at age 20, married Frank Besant, a clergyman, and they had two children, but Annie's increasingly anti-religious views led to a legal separation in 1873. She then became a prominent speaker for the National Secular Society (NSS) and writer and a close friend of Charles Bradlaugh. In 1877 they were prosecuted for publishing a book by birth control campaigner Charles Knowlton. The scandal made them famous, and Bradlaugh was elected M.P. for Northampton in 1880. She became involved with union actions including the Bloody Sunday demonstration and the London matchgirls strike of 1888. She was a leading speaker for the Fabian Society and the Marxist Social Democratic Federation (SDF). She was elected to the London School Board for Tower Hamlets, topping the poll even though few women were qualified to vote at that time. In 1890 Besant met Helena Blavatsky and over the next few years her interest in theosophy grew while her interest in secular matters waned. She became a member of the Theosophical Society and a prominent lecturer on the subject. As part of her theosophy-related work, she travelled to India. In 1898 she helped establish the Central Hindu College and in 1922 she helped establish the Hyderabad (Sind) National Collegiate Board in Mumbai, India. In 1902, she established the first overseas Lodge of the International Order of Co-Freemasonry, Le Droit Humain. Over the next few years she established lodges in many parts of the British Empire. In 1907 she became president of the Theosophical Society, whose international headquarters were in Adyar, Madras, (Chennai). She also became involved in politics in India, joining the Indian National Congress. When World War I broke out in 1914, she helped launch the Home Rule League to campaign for democracy in India and dominion status within the Empire. This led to her election as president of the India National Congress in late 1917. In the late 1920s, Besant travelled to the United States with her protégé and adopted son Jiddu Krishnamurti, who she claimed was the new Messiah and incarnation of Buddha. Krishnamurti rejected these claims in 1929. After the war, she continued to campaign for Indian independence and for the causes of theosophy, until her death in 1933.